This week, I decided to take a break from some American authors and go across the pond to England. There is just something about reading a novel from a British author. You can definitely tell the difference between the two types of prose. 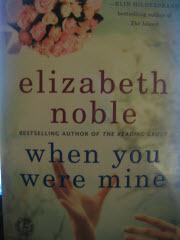 Verbiage and style are distinctly different.In When You Were Mine, by Elizabeth Noble, Susannah discovers that she has let her life slip by for the last eight years that she has been living with Doug. While making this discovery, she reminisces about her first real boyfriend and then just so happens to run into him unexpectedly. What would you do if you finally realized that life has past you by and you haven't done any of the things that you wanted to do? Just to complicate matters, her best friend, Amelia discovers something as well. Together they get thru the next year but not without a few bumps along the way.